FOXBOROUGH, Mass. 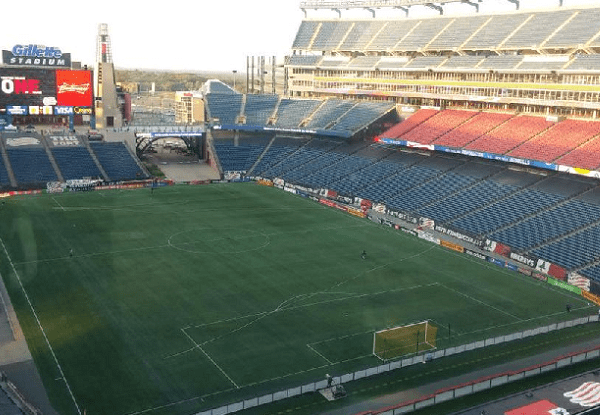 – Welcome to Gillette Stadium, where the top spot in the conference is up for grabs in tonight’s clash between the streaking Revolution (12-9-7, 43 points) and the high-octane New York Red Bulls (13-7-6, 45 points). Kickoff is set for 7:30pm. Tonight’s match marks the final time the longtime rivals will face each other during the regular season. On May 2, the Revolution grabbed a 2-1 win at Gillette Stadium before dropping a humiliating 4-1 loss to Red Bulls side that showed no mercy back on Jul. 11. Be sure to follow @nesoccertoday on Twitter throughout the evening for live updates. What’s at stake? For the Revolution, well, only a spot at the top of the table. With only two points separating them from the Red Bulls and DC United, both of whom are on 45 points, the locals will be keen to get a particularly valuable trio of points. For the Red Bulls, a point will suit them just fine, especially with another tough road tilt awaiting them on Saturday at Portland. Biggest question: Can the Revolution get the win without Jermaine Jones, who’ll be suspended for Wednesday’s clash? Without their inspirational leader (not to mention best player), it’ll be up to others like Daigo Kobayashi, Andrew Farrell, Jose Goncalves and Scott Caldwell to ensure the shape stays sound, while Lee Nguyen will need to stay on his game to steer the Revolution to victory. Weather: It’s a warm, late-summer evening here in Foxborough, with temperatures in the low-80s under clear skies. Precipitation is not expected to be a factor before the final whistle. Referees: Ismail Elfath will be the referee on Saturday. The last Revolution game in which he served as the man in middle was the 2-1 loss to DC United at RFK Stadium on Jun. 21. Joining Elfath will be Kermit Quisenberry (AR1) and Scott Kachmarik (AR2). The fourth official will be Alan Kelly.